A year ago, we introduced TypeTastic, a brand-new way for K–3 kids to learn keyboarding by playing games. Since then, more than 1,000,000 of you have played our games. And now, based on your fantastic feedback and requests, we’re expanding TypeTastic to include games for all grade levels! We’re delighted to introduce TypeTastic School Edition, which includes a fun and inspiring K-12 keyboarding curriculum along with a suite of teacher tools. The expanded curriculum introduces students to more than 300 entertaining new keyboarding activities that cover touch-typing, fluency, numbers, and symbols. Students go on a thrilling island adventure to collect words and letters in bright and exciting landscapes. 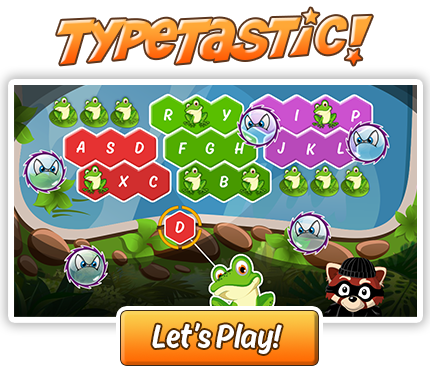 Along with the new games, TypeTastic School Edition includes all the original games that have been such a popular way for younger students to play their way into typing in just a few hours. To help support teaching every step of the way, TypeTastic School Edition saves every student’s scores in detail, making it easy for teachers to track students’ progress. Teachers can also deliver customized typing tests to check on how their students are doing. TypeTastic School Edition works on every device, right away, without apps or plugins. Teachers can select between three different plans, with prices starting from $59 for homeschools and $99 a year for a class of 40. School prices start from $249 for minimum of 60 students. More detailed price calculator available here. A free trial is available here, as well as a selection of complimentary games to help K–5 students get familiar with the keyboard. We hope you love it as much as we do! Can you explain the pricing a little more? I teach computer skills across all grade levels (K-5) which amounts to close to 1000 students. Thank you for your request for pricing. We’ve sent the quote to your email address. I am waiting on the Access Code for the school edition. I filled out the form for the free trial, but I am not sure if I missed something. Our school is seriously considering this program for the start of the school year next month, but we can’t find the pricing anywhere. Where can we find this information? That’s wonderful to hear! We’re going to publish the full pricing list around the release time in the coming weeks. I’d be happy to send you a quote for you. I’ll send you an email and ask for the student amount. I would like to find more details on the teacher side (FAQs) . . . what exactly can we monitor with the students, what does it look like for the middle school grade level, can “students” licenses be reused each semester, etc. My first comment included my personal email. This one includes my school email. Hi Stephanie! Unfortunately, we can’t see your email address and therefore unable to reply to you in an email. The teacher side shows your students’ progress in every course; time spent, completed tasks, net speed, gross speed, accuracy and more. Licenses are per student and you can purchase licenses for the amount of students you will have using TypeTastic. I have semester classes so with the licenses I would just wait until mid-year to purchase the rest? I’m not sure I would want to purchase all of them at once if the first semester licenses aren’t reusable since schedules can change. Also, I can’t remember if I read this or not, is there a trial subscription that teachers can try out? If it’s difficult to anticipate the number of users who would be using TypeTastic during the school year, it’s possible to make a supplementary purchase during the school year. Home School plan is available for purchase right now. It’s $59 a year for up to 5 students and the teacher. You can pay it online with a credit card (Purchase orders are available for School Plans only). Wondering how to proceed with the purchase? Your license will be activated on your account immediately after credit card purchase. The remaining trial days will be added to the subscription time, which means you can purchase without hesitation during the trial already. If you have any other questions concerning the pricing, please contact us again. We are a school and want to know how we go about making a purchase. Do you accept purchase orders? I find it very hard to figure out purchasing details on your site. I teach Special Ed. in small district. I might only have 2 at the most in this class of keyboarding. I had 1 last year and 2 this year. Would the price still be $99. ?